Today Social networking or we can say Facebook has got so much popularity when we talk about top social networking sites online and one of them is Facebook, there are so many people who love to share there stuffs on this type of social networking sites. There are so many people who just use Facebook to get more popularity of there online stuff or anything that they want to promote, people will also get so many ways to connect with people on Facebook or any other social networking sites but here I will talk about Facebook only and I will also tell you that how you can connect and get Email contacts of your Facebook friends so you can contact your friends directly. Getting Email contacts of your Facebook friends is not an easy task if one of your friends has not added it in his or her profile so how you will know the Email ID of that friend that he or she used to log in to there Facebook account. If you want to know one or all of your friends Email ID which they used to log in to there Facebook account, you can use my own trick or you can say its an easy way to get Email ID of your friends the way is very simple and easy and id doesn’t take much time the only thing you need is a Yahoo account if you already have a Yahoo account then you can go ahead if not then just create one. 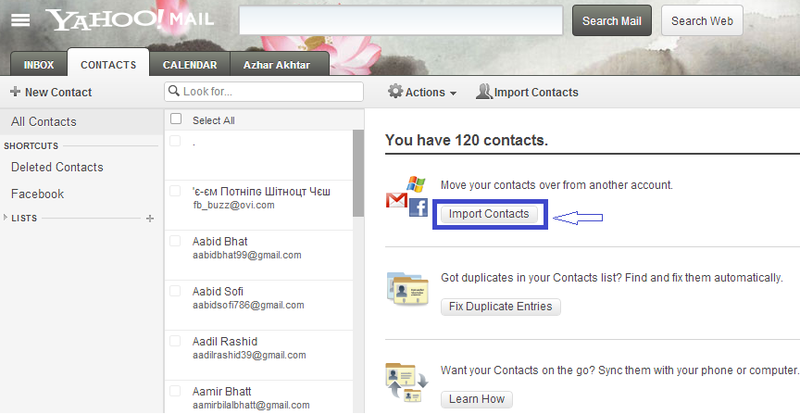 Note: If you get any error importing your contacts just use another browser. Also, this article is written for the education purpose only don’t use this trick for any wrong purpose. thanks for reading this I hope you enjoyed it.